How does the Mac gain share while increasing its price premium over the Windows PC? Apple set a new record for Mac sales in the fourth quarter. This was not a surprise. The growth was perhaps a bit lower than some expected (including me) but it was still a healthy 23% and 8x the PC growth rate. 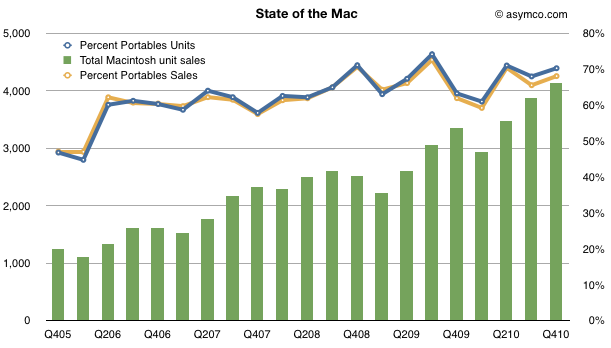 The Mac has outgrown the PC (and hence has gained share) for 19 quarters straight, nearly five years. What’s more interesting is where the growth came from. Every region outgrew the market. Asia-Pacific led with a 67% year-over-year increase, almost 10x the market. Japan grew at 56%, which is about 6x the market, and Europe and the United States both grew in double-digits despite both markets contracting overall. 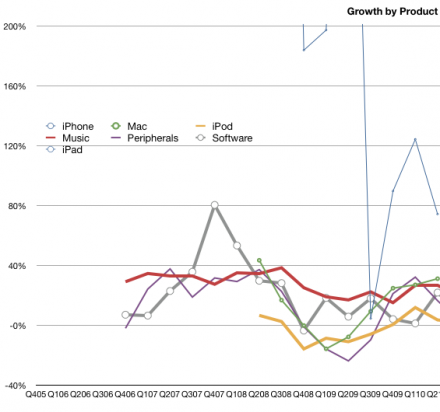 Looking over a longer time frame, the Mac has nearly quadrupled in volume in five years. In the last quarter of 2005, Apple sold 1.2 million units. In the latest quarter it sold 4.1 million. So the performance has been relatively good. One significant reason for the growth has been the shift from desktop to portables. The lines show how the percent of portables went from about 50% to 70% of units and sales in four years. When the iPhone vs. Android rhetorical war heats up, both sides bring up the history of Macs vs. Windows PCs. The commonly held thesis is that Windows triumphed as the PC was commoditized (and modularized). This triumph was at the expense of the over-serving and over-priced Mac. This is a largely accurate view of what happened during the 90s. But the problem with this thesis is that (1) the PC’s job has been slowly changing in the last decade (2) the Mac keeps growing faster than the PC and (3) Apple keeps capturing a vast portion of the profits in the PC industry. These anomalies or contradictions to the thesis imply that something changed. What changed and can these changes turn the tables on the market and create an opportunity for a new computing disruption? Increasingly, companies are giving their employees a choice to either use Microsoft Windows PCs or Apple Inc.’s Macs, the analyst said. And, increasingly, employees are choosing Mac over Windows. To boot, Chowdhry said 70 percent of college freshman are entering school with Macs, up about 10 percent to 15 percent from a year ago. via Microsoft shares retreat after downgrade. Remarkable indeed. I remember when in 2007 40% Macs was headline news at Princeton, having quadrupled from 10% in 2003. [Update] Chowdry’s estimate seems an exaggeration but Mac share on campus seems to be growing. The most current data shows a probable 50% penetration in private colleges (my estimation is 70% is accurate for Ivy League schools) but a probable 20% penetration at public schools. Still way above retail share in the US (10%) and way above corporate share of practically naught. [Update 2] According to survey data from Student Monitor, among those who planned to purchase a new computer, 87% planned to buy a laptop. And among those students 47% planned to buy a Mac. 47 percent of 87 percent is a lot more believable. The chart from Fortune Tech shows that intent to buy for Apple went from 14% to 47% since 2005. Apple Reports Third Quarter Results. I was surprised by the poor predictions of Mac units by the analyst community with estimates ranging from 2.86 million to 3.51. 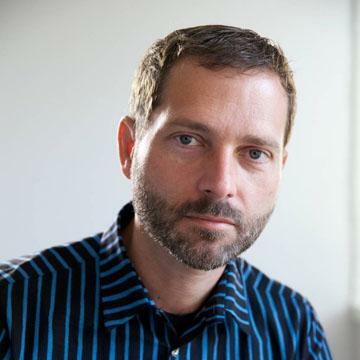 It was fairly clear to me early in the quarter that the product would get 30%+ growth. There was little news except overall Mac momentum to shape the forecast and it seemed logical that the growth would stay inline with the last quarter which was 32.8%. I dialed in 33% after the first month and stuck with this so my forecast came out to 3.46 million. In the event, 3.472 million were sold for a growth of 33.4%. The ASP came in at $1,267, slightly down from $1,278 last quarter and $1,289 the year before. ASPs are eroding but Apple are holding the rate down with product updates. Looking forward, I’m forecast $1,300 ASP.